How’s your week shaping up? Just this past weekend my sister threw a really pretty outdoor BBQ to celebrate Father’s Day and my birthday. Her backyard is the perfect setting for a relaxed dinner with family. All I had to do was bring the wine and an appetizer and she did the rest. Such a good sister. 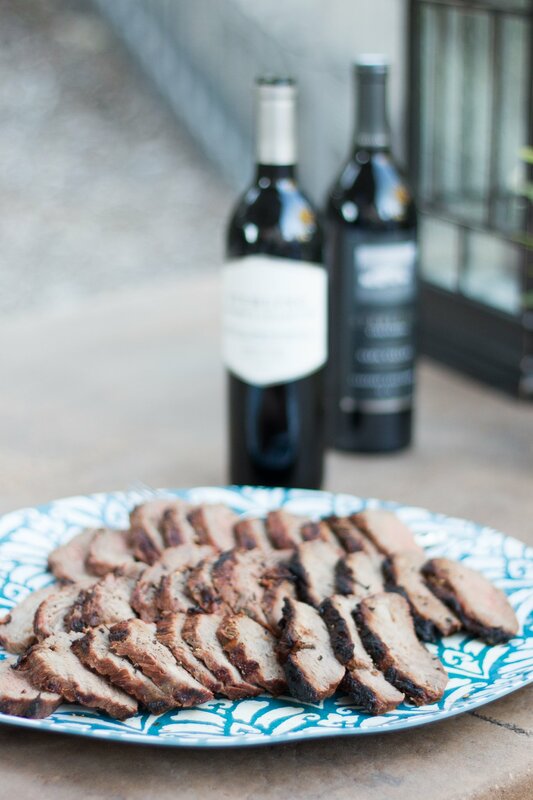 Here are a few photos from our summer BBQ & marinade recipe that is out of this world. 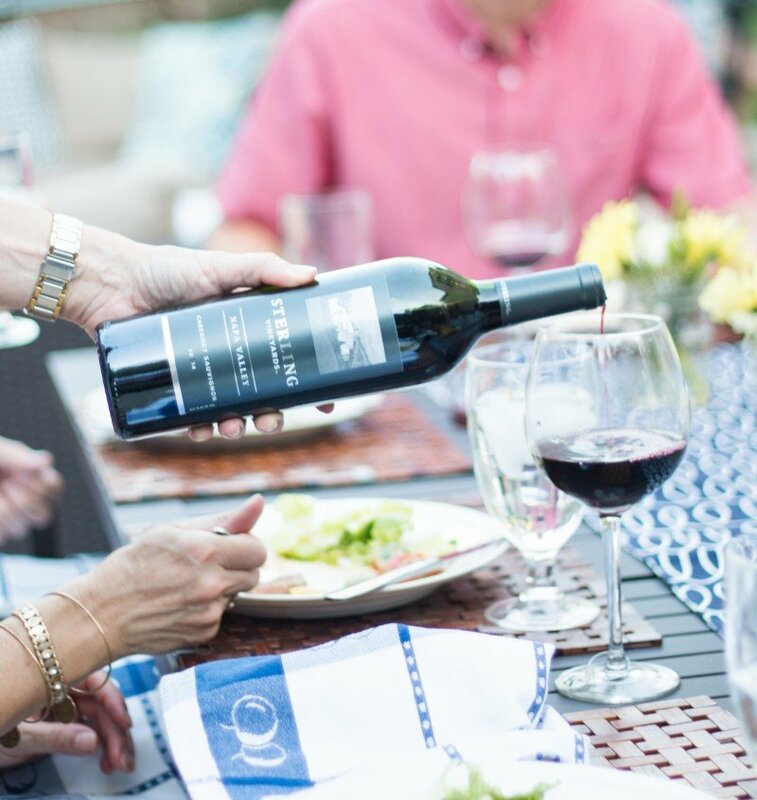 When casually dining, it’s all about the company, good food and great wine. We honestly talked and laughed for hours and that’s the beauty of family coming together. We waited until the sun wasn’t so intense to set the outdoor table. 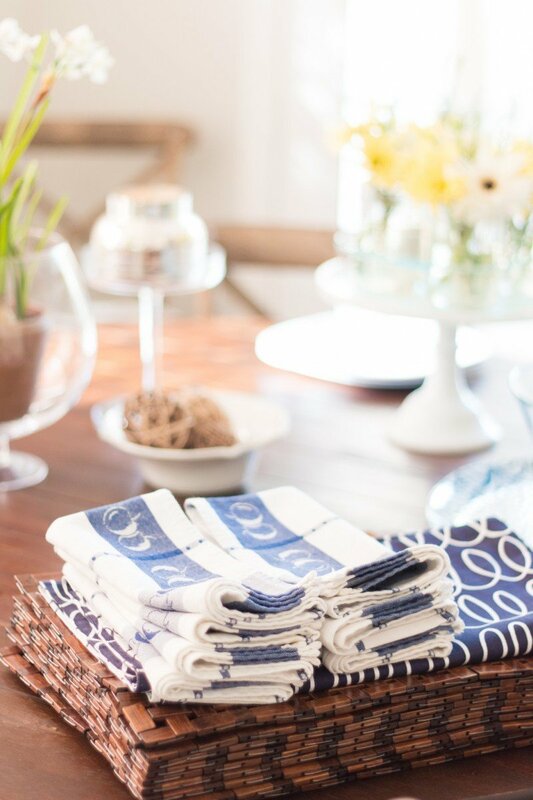 Having your linens stacked and ready to go make prepping to sit down for dinner super easy. And if it’s especially warm, you may want to keep the flower arrangements inside until the sun starts to set. And a classic set of napkins like this never go out of style. The blue and white is really fresh for summer time. My sister happened to pick this set of napkins up as a souvenir from Paris when she went with her husband. I love the idea of bringing back something that you will use when you entertain. What a special way to bring back those memories while showing hospitality. And they are lightweight and can’t break in the suitcase. Genius. 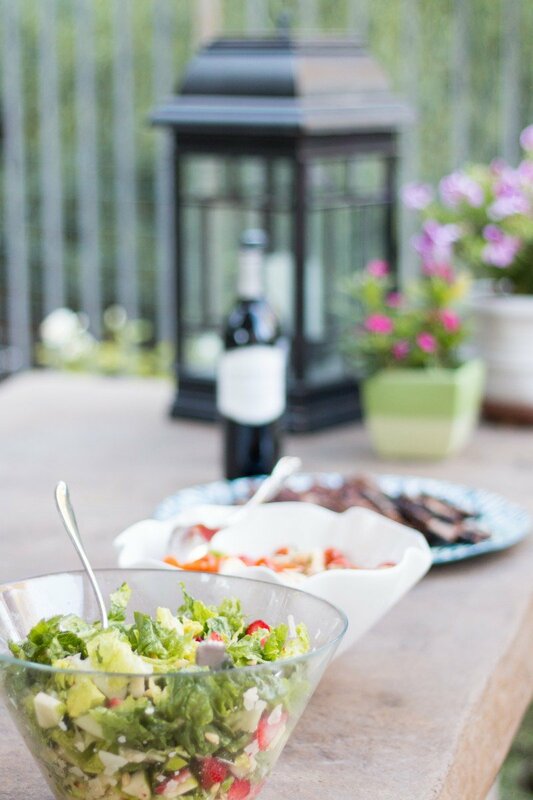 Without question our favorite part of summer is enjoy meals outside with the family. I love sitting back and observing the conversations, especially among the little ones. 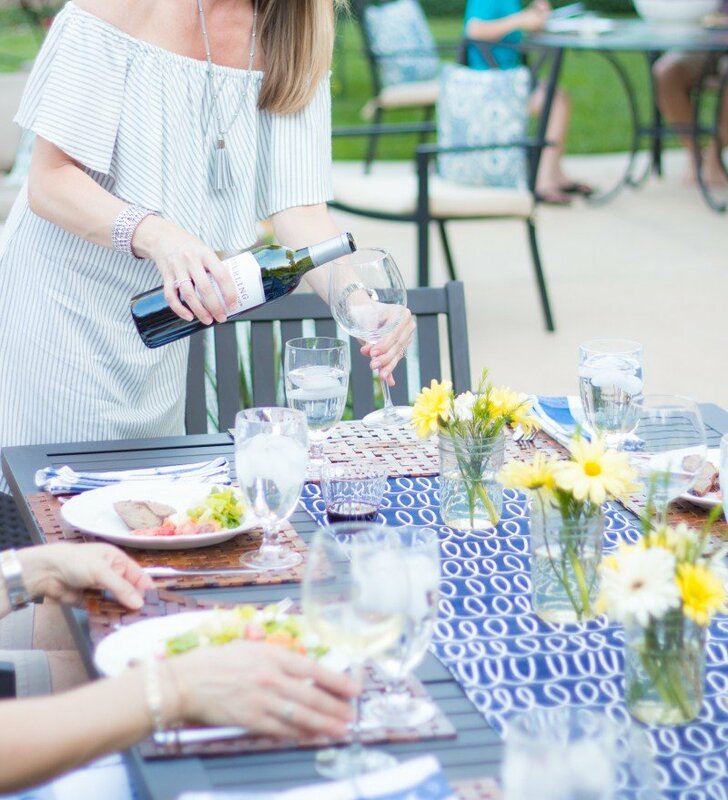 Those acrylic goblets are great for outdoor parties and are on sale right now. The runner is by Kate Spade. While this print is no longer available, this polka dot one is darling. When it’s warm outside, it’s nice to serve a main dish with cold salads. For this particular night my sister prepared a summer green salad with apples and slice strawberries. We also had a delicious tomato salad. For steaks, chops, chicken, ribs, almost any meat you like. Pour over meat in plastic bag, pan or bowl and refrigerate several hours or overnight, turning occasionally. BBQ and enjoy! Combine all ingredients and mix well. Store in tightly covered jar in refrigerator or freezer if not used immediately. This marinade (pulled from a smoker cookbook) is absolutely amazing. Can not recommend it enough. My brother-in-law knocked it out of the ballpark. Very thankful to have family nearby. I know not everyone does. And life can get so hectic on a day-to-day basis so it’s nice to push pause and spend quality time with one another. 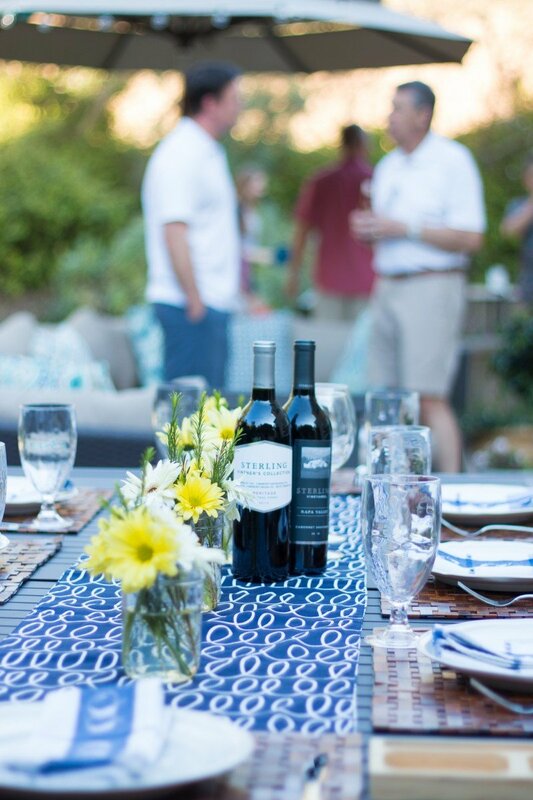 And summer marks the beginning of many outdoor gatherings. Let me know if you try the marinade or the cab. Both are so good!!! 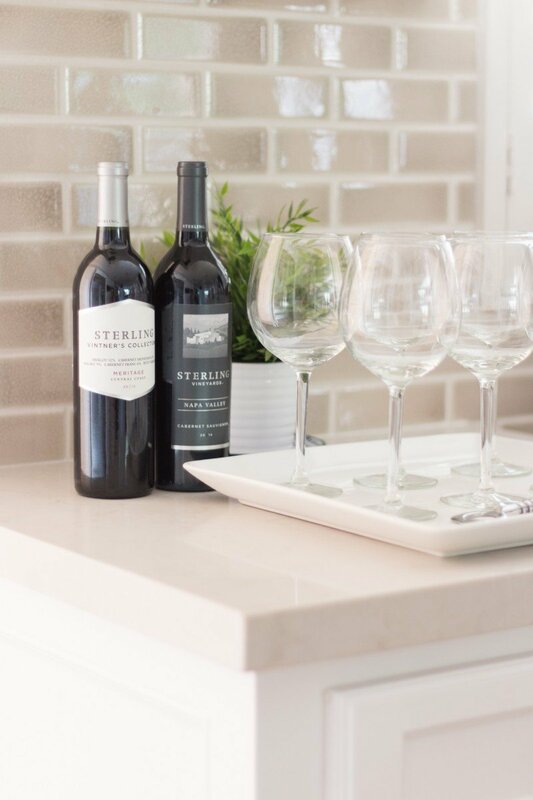 To see my trip to Sterling Vineyards, go here. Please note: I am working in partnership with Sterling Wines and I am being compensated for my participation in this campaign. All thoughts/opinions are 100% my own. Wine is intended for those whom alcohol is legal and appropriate. Please Drink Responsibly! What a beautiful, relaxing table setting! The food looks scrumptious. Will have to try the wine as well. I love the napkins she brought back. Need to remember to look for things like that on our travels. She has such a great way of entertaining! And I agree. . . fun way to remember a special trip. Happy 4th, sweet friend. Love the blog! I have followed your blog for a few years and have never been disappointed. 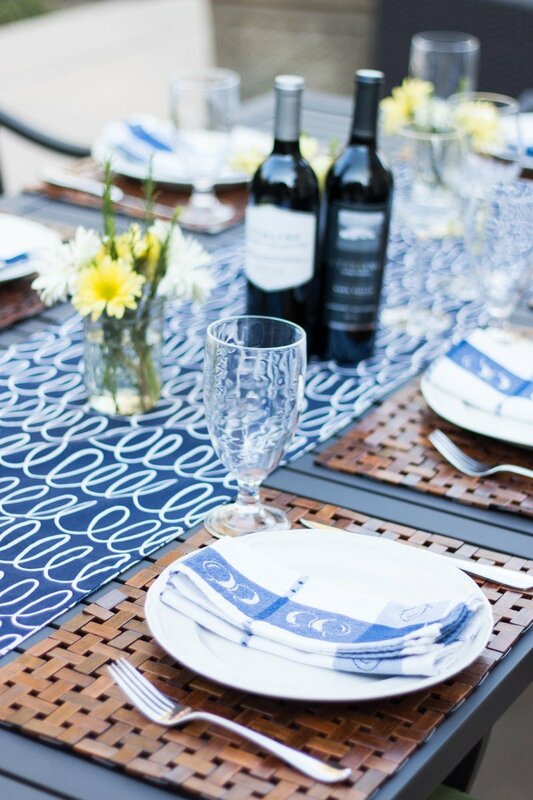 Love when you mix table style, fashion and recipes all in one post. I have to second the motion to find source for those placemats!